Just exactly what do the albums look like that are supposed to hold the cards? We can check it out below... An album has even more tidbits of info on the subject of the cards and the tidbits are written in the margins. You typically have the choice of covering an English or French description of the subject matter so the words on the back of the cards are not lost. All of the albums are roughly the same dimension, 7¼" across and 4¾" high (18.5cm x 12cm). All hold 48 cards. 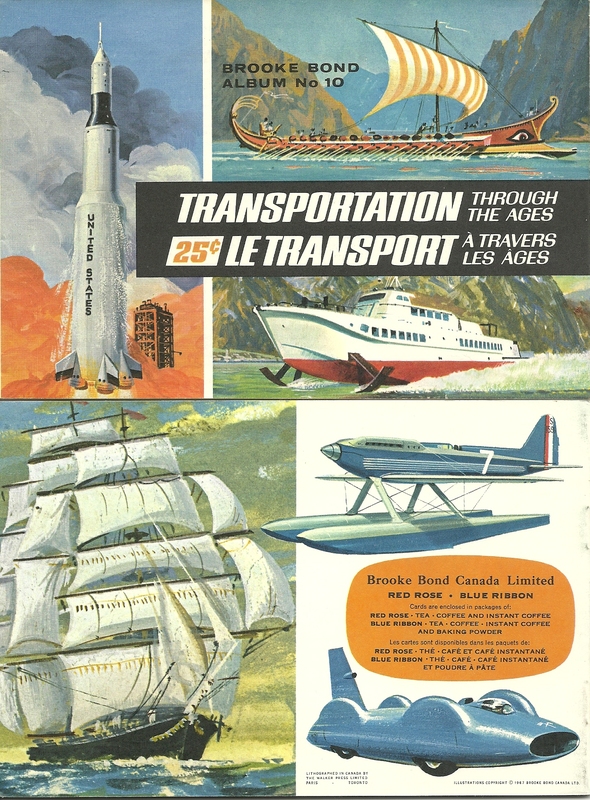 This is the cover of the Transportation Through The Ages album. As the cover says, it's series 10 and originally cost a quarter. You can paste and yes some have stapled and taped (the last two aren't good for cards or albums!) the cards into the albums in the places shown. Additional info on the same theme as the cards is also found in the album pages. Albums are great. This scan shows the #13 North American Wildlife in Danger album open. There is no #17 card so you see two descriptions, one in English, the other French. Whoever glued in the remaining cards chose to cover the French descriptions and leave the English showing. Below the Manatee picture is a snippet on the massacre of blue whales. Beside the Manatee is a snippet on Stellar's sea cows. I have found that many people collect albums in two fashions. First, they get a full or partially full album. If it is partially full then they typically fill it. So now they have a full album for each series. Then they also collect an empty one for each series. The value of an empty one is much greater than one that is full. Why? Because full ones are a dime-a-dozen (very plentiful) while empty ones are harder to come by. You can fill an empty or partially empty album with cards that look OK on the front but that might be damaged on the back. Another problem with full albums is, "Who put them in?" Was it a kid (cards could be crooked, covering the wrong place or very over glued. Was it someone who taped the cards in? Boy, that really ruins the cards and the album after a few years. My favorite was the woman who taped the cards in, then, when they started to fall out a few years later, she stapled them in! Those cards were not going to fall out again. There are many choices for mounting. Bad because it's easy to slop over onto the front of the card or between the page you are on and the next one. Bad because some types of glue turn brown as they get older and the appearance isn't so good. Good because cards are not damaged (if you are careful) when you mount them. Bad because you ruin the empty album if you ever decide to remove the cards. Bad because you ruin the album with permanent discoloration and stickiness. Bad because you ruin the cards with permanent discoloration and stickiness. Bad because you ruin the album with staples and the holes they make. Bad because you ruin the cards with staples and the holes they make. I use a nice white glue stick. I can control how much gets onto the card and after 5 years I still have no yellowing. What's your favorite way to mount the cards?